This article goes over exactly how to setup your command-line options for Team Fortress 2 which is extremely important in a competitive game like TF2. A good player always looks for any edge they can get, and that includes command-line tweaks. While in Steam, 1. select Library then Games, 2. 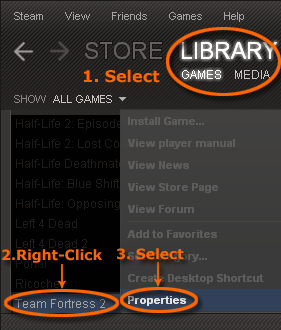 Right-Click Team Fortress 2, then 3. click "Properties" as shown in the picture below. 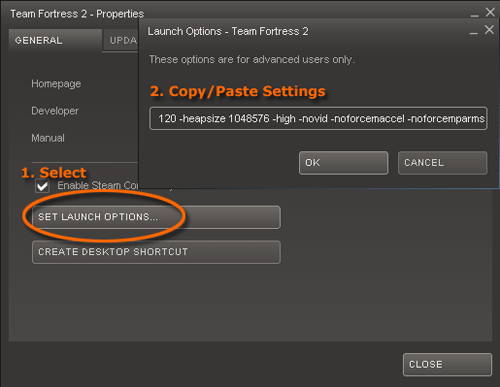 From here you can enter in a variety of launch options for Team Fortress 2.. I personally like to use the following settings..
"-dxlevel 95 -console -refresh 120 -heapsize 1048576 -high -novid -noforcemaccel -noforcemparms"
The explanation for these settings can be found below..
-refresh 120 Sets monitor refresh rate to locked rate of 120hz. You need to be on a CRT to be able to make use of this command. If you're on an LCD, you unfortunately cannot go above 60 or 75 due to limitations with the technology. Contrary to popular belief, refresh rates do effect LCD's, even though they do not refresh like standard CRT's. That's an entire another article though. -Heapsize 1048576 Allocates the optimal amount of memory depending on your computer. Take your amount of ram in kB and divide by 2. Since i have 2 gigs of ram, or 2097152 KB, i divided by 2 to get 1048576. You can reference below to find yours.. Your -heapsize should be: "262144"
Your -heapsize should be: "524288"
Your -heapsize should be: "1048576"
-high This command is probably the most important. It will force your computer to put Team Fortress 2 in high cpu priority, giving less resources to background processes, and more for TF2. -noforcemaccel This command disables mouse acceleration in TF2. Very important if you'd like to build consistent aim. -noforcemparms This command prevents windows from interfering with Team Fortress 2 and using desktop mouse acceleration settings. *Also you can force your screen resolution with either the -width or -w command. Example -w800 would set the screen resolution in TF2 to 800x600. That's all i got for now, make sure to check out my other article, "Running steam in low CPU priority" here.